A visit to Turkey would not be complete without a stop at one of the country’s better known spas, whether to treat a health problem or simply to luxuriate in the soothing waters of natural mineral baths. A stop at one of the spas described in this booklet can easily be combined with a tour of Turkey’s most famous destinations. The health-giving properties of Turkey’s natural hot springs have been renowned since antiquity. The ancient city of Hierapolis was built on the site of the rich mineral waters of Pamukkale, where the steaming water has hollowed enormous circular basins in the earth as it flowed down the mountainside, coating the slopes in a smooth layer of dazzlingly-white calcareous rock. No doubt the residents of the ancient Lycian city of Caunos bathed in the mineral-rich mud of nearby Köycegiz Lake. The Balçova / Izmir hot springs are located on the site of the Baths of Agamemnon, known and used in Roman times for the therapeutic qualities of the waters. Bursa, the first capital of the Ottoman dynasty is nestled against Uludag (Mt. Olympos to the ancients). 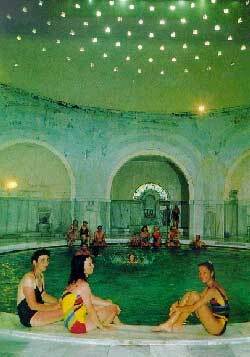 There the natural hot springs of Cekirge prompted the Ottomans to build a large complex of domed baths during the reign of Murat I (1359-89) on the site of an earlier Roman and Byzantine baths complex. On the shores of the Aegean, Cesme is famous for its natural mineral springs and therapeutic qualities of the sea water. And amidst the verdant forests of the southern shore of the Sea of Marmara, Yalova hot springs pours out mineral-rich waters thought to cure a variety of ailments. The spas described in this brochure are concentrated in the Marmara Region and Aegean Region of western Turkey and are easily accessible from popular destinations such as Istanbul, Izmir, Pamukkale and the Marmaris / Fethiye area. 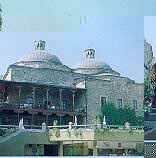 But, while touring through Central Anatolian Region (Central Turkey), there is one thermal spa well worth mentioning here, spa of an extraordinary character and one of its kind in the world. It is visited by people searching for cures from all over the world. This healing spa is called “Kangal Hot Spring with Fish” and it is only 13 km from Kangal town in the province of Sivas. The beneficial waters of 36 C contain bicarbonate, calcium, magnesium and also many small fish (2-10 cm long), which play a vital part in curing various skin diseases. There are also two other thermal spas in this province: Sicak Çermik and Soguk Çermik, famous for their valuable therapeutic treatments. 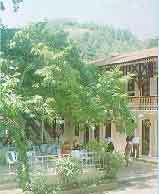 Well-known and highly recommended for their thermal facilities are the famous spas of Oruçoglu and Sandikli near Afyon, Gönen near Balikesir and Bolu. Take a lesson from the ancients and treat yourself to a natural health cure during your visit to Turkey. Yalova hot springs are located to the south of the Sea of Marmara, 11 km southwest of the town of Yalova in a wonderfully green setting. The Yalova hot springs have a natural water outlet, flowing at a rate of 15 liters per second with the potential capacity of 1,651 person/day/bath and 1,651 beds on the basis of 600 litres per person/day/bath. Yalova hot springs have a composition of sodium chloride, calcium sulfate and fluoride. With a temperature of 57 to 60 C, 7.3 to 7.6 PH, and 1,435 mg/lt total mineral content, the waters are suitable for bathing and drinking. Yalova hot springs are known for their therapeutic qualities, especially for rheumatic diseases, digestive maladies, neurological and urological disorders and metabolic problems. Yalova spa incorporates open and covered pools, baths, offers massage, underwater massage and drinking cures. The spa includes two hotels with a total of 202 beds, a first-class restaurant, cafe, a very attractive park and forest. The Balçova hot springs are located on the site of the Baths of Agamemnon, known in antiquity for the therapeutic qualities of the waters. According to a legend,Agamemnon was advised by an oracle to bring soldiers who had been wounded during the campaign against Troy to the sulfur-rich waters of these natural hot springs. Balçova is situated to the west of the Aegean port of Izmir. The Balçova hot springs flow from exploratory wells at a rate of 28 litres per second. The facilities can accommodate 3,456 bath-days and 3,456 beds on the basis of 600 litres per person per day per bath. The Balçova hot springs are composed of sodium chloride and calcium bicarbonate. 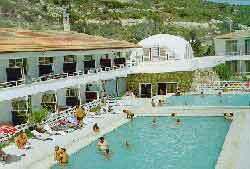 With 62 to 80 C water temperature and 6.4 PH, Balçova hot springs contain 1,369 mg/lt minerals. The Balçova hot baths complex, with a total capacity of 1,000 persons per day, provides hot mineral pools and baths, offers patient therapy pool, sauna, massage, underwater massage, physical exercise, electro-therapy and physical therapy. The complex incorporate a three-star hotel with 435 beds, a four-star hotel with 624 beds and a new park. Çesme, the Turkish word for fountain, is abundantly endowed with natural hot springs. Located on the Aegean coast, 70 km west of Izmir, the holiday resort has two excellent hotels, both of which have complete spas. Turban Hotel uses mineral waters from a natural hot spring, while the facilities at Altinyunus Holiday Resort utilize mineral-rich seawater. Set on a long sandy beach, Turban Hotel has 432 beds. 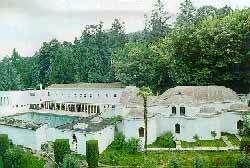 The hot springs flow at a rate of 15 litres per second and can accommodate 500 people a day. Altinyunus Holiday Resort, situated in a cove along the seafront, has 1,030 beds. Its Natural Sea Spa can handle 500 people per day. Altinyunus spa has a similar composition. These waters are heated and used for treating rheumatic, dermatological and gynecological diseases. They are also recommended for neurological exhaustion and to help strengthen the muscles. Turban Çesme Hotel provides hot mineral pools and baths, offers underwater massage, physical exercises and geriatric units. Turban Çesme Hotel has 432 beds while the larger Altinyunus has 1,000 beds. At Pamukkale (“Cotton Castle”) nature has produced a sight of spectacular beauty. For thousands of years an underground spring located deep in the earth has been pouring out streams of hot mineral-saturated water. As it has flowed down the mountainside the steaming water has hollowed enormous circular basins in the earth, and their rich mineral content has coated them in a smooth layer of dazzlingly-white calcareous rock. To the ancients such beauty could only mean that the place was holy to the gods. Built near the natural hot springs, the grand city of Hierapolis attracted a steady stream of pilgrims, who came to bathe in the curative waters. Pamukkale is located 250 km from Izmir and 20 km from Denizli. The Pamukkale hot springs flow at a rate of 500 litres per second. With the potential facilities of about 72,000 bath-days and 72,000 beds on the basis of 600 litres per person/day/bath. The mineral-rich Pamukkale hot springs are composed of calcium-magnesium sulfate and bicarbonate. They contain carbon dioxide and have a radioactive content of 1,537 picokuri/liter or 56 bekerel/liter). Water temperature is 36 to 38 C with a PH of 6. Total mineral content is 2,430 mg/lt. Throughout history Pamukkale has been a famous spa, with both baths and open pools set into the snow-white cliffs. 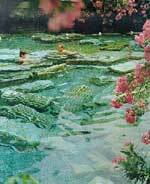 Bath treatments take place at natural pools developed around the main hot springs. Hot mineral water spas have been opened at a number of new and very comfortable hotels in the area. Total capacity is 4,000 beds. Scenic Köycegiz Lake, located near to Dalaman Airport and within convenient distance of Fethiye and Marmaris, is well known for its natural hot springs and mud baths. The lake narrows into a channel, flowing into the Dalyan river and emptying into the Mediterranean at one of Turkey’s most spectacular beaches. The beach is the breeding ground of the Caretta caretta sea turtle. The reed-edged river meanders to the sea, surmounted by 4th century BC Lycian rock tombs. Nearby are the ruins of the ancient city of Caunos. Situated next to a natural channel between Köycegiz Lake and the Mediterranean Sea, the Riza Çavus Thermal Baths form a water pool and a mud pond, with a flow rate of about eight liters per second. The mud and mineral baths can accommodate 1,000 persons per day. A second spring, Velibey Thermal Baths, is located 1.5 km north of Riza Çavus, has similar qualities and a flow rate of 20 litres per second. The Riza Çavus natural hot springs contain sodium chloride, hydrogen sulfur, bromide, fluoride, natural radio active (3,770 picokuri/liter = 139 bekerel/liter), with a total salt and mineral content of 28 gr/lt. Temperature of the mud and water is 30 to 38 C, and PH about 6.5. Having very attractive physio-chemical qualities, these hot springs are good for the treatment of rheumatic, dermatological and gynecological diseases, as well as neurological and physical exhaustion. The Köycegiz baths do not offer overnight accommodation. Most visitors stay at small hotels and pensions in nearby Dalyan. The baths can be reached from Dalyan by small boats. The treatment consists of covering the body with a layer of mud and then soaking in the hot mineral waters.